Title: RELIGION OF ANTICHRIST SUDDENLY SURGING IN IRAN! Subtitle: Sudden surge in the ancient pagan religion of Zoroastrianism in Iran is another "sign of the times", a sign that the appearance of Antichrist is clearly close. The "signs of the times" abound all around us, as Cutting Edge continuously points out. We see the world moving rapidly to a global government, economy, and religion, just as prophecy in the Book of Revelation and Daniel foretold so many centuries ago. These are exciting times in which to live for the Born Again Christian, for these prophecy fulfillments serve as validations of the Bible and of the Holy Spirit behind the Bible, just as God originally intended. This story is one of those exciting "signs", for the Black Magick religion from which the religion of Antichrist will spring is now experiencing a tremendous surge of popularity in Iran! This new popularity has sprung forth, even if face of great government opposition and persecution. If the coming of the "Great One" is close, this phenomenon should be expected. Right on cue with other prophecies being fulfilled, it seems highly significant that the very religion from which the religion of Antichrist will spring. Let us quickly review the current news story. "From al-Reuters, we have a masterpiece of disinformation. 'ISFAHAN — Iranian authorities beat up and tear gassed exuberant young revelers as they breathed new life into a pre-Islamic fire festival with a night of dancing, flirting and fireworks. The Islamic Republic, which has an awkward relationship with its ancient Zoroastrian religion, only gave guarded recognition to the Chaharshanbe Souri festival last year'." "The Islamic republic does not have 'an awkward relationship' with Zoroastrianism. 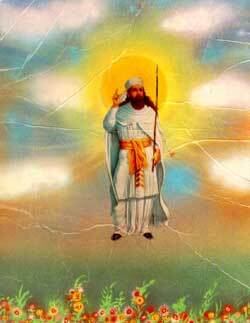 It forbids Zoroastrian practices, including the celebration of the Zoroastrian New Year, Norooz. Forget about 'guarded recognition'; there is a ban ... there is a big Zoroastrian revival under way in Iran ... And to say that the authorities 'beat up and gassed' some 'revelers' is quite an understatement, since, on the evening of March 15h, there were very large-scale demonstrations all over Iran ... But al-Reuters makes it sound like a frat party that just got a bit out of hand..."
How large were these Zoroastrian celebrations? This kind of treatment at the hands of the brutal, hardline Iranian regime is a high price to pay for worshipping according to a very Ancient polytheistic pagan religion, which is what Zoroastrianism is, as we shall see in a few moments. Islam is severely monotheistic and has historically refused to allow any compromise with "heretical" religions which worship more than one god. Thus, we should not be surprised to learn that the established Iranian Islamic regime has reacted so strenuously to this public celebration of the Zoroastrian New Year celebration. Now, let us study the roots of Zoroastrianism and why it is so important today. First, let us address why this ancient religion is so important today. In late 1996, I received an email from a person who identified himself as a Black Magick Satanist; he stated that, while I understood much about Black Magick, I needed to be aware that the book, "Thus Saith Zarathustra", by Nietzche, would be the "Bible of Antichrist". Based upon this bit of information, I bought the book and now keep it on my bookcase for ready reference. This Black Magick religion is said to have been founded on the legendary figure, Zarathustra, a man occultists consider to be a "type" of the coming Antichrist. 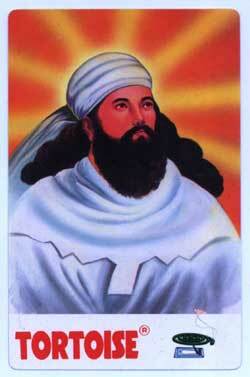 Zarathustra is the founder of Zoroastrianism, according to legend. Note that these images basically show him dressed in white. 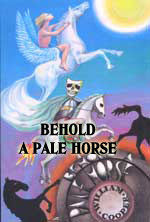 In Black Magick Witchcraft, the color white is considered the preeminent color. Since the color, white, is comprised of all colors, and black is a lack of color, white is considered most powerful; black must give way to white. 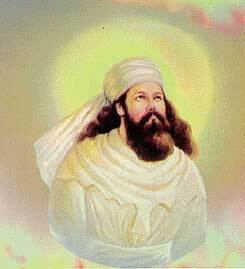 White is also considered to be inherently based in the spiritual, since white is the color worn by Zarathustra. Please examine these images carefully. In one of the images, Zarathustra is surrounded with a halo around his head, signifying that he is "divine". Indeed, he is the foretold Messiah figure of the Zoroastrian religion, thus making him a perfect type of the coming Antichrist. Remember your sacred history: the "Wise Men" who visited the baby Jesus on camel, as recounted in Matthew 2:1-12, were "astrologers" [Amplified Bible Commentary, p. 1076]. Further, they were "Magi" astrologers, which tells us they were descendents of the "Wise Men" of King Nebuchadnezzar's court during the time of Daniel. Since the three Wise Men were religious scholars, and part of the king's court, they had access to the writings of Daniel. Further, the three Wise Men were Magi, which was an order of the Pagan Medo-Persian religious order of Zoroaster. (Dictionary Of The Bible , edited by William Smith, The S.S. Scranton Company, Hartford, CT, 1904, p. 501.) The Magi were ancient interpreters of dreams and were astrologers (monthly prognosticators). We see them in the Old Testament in the court of the Babylonian King, Nebuchadnezzar. Nebuchadnezzar gathered around him the top religious men of the religions of the nations which he had militarily conquered. Daniel was also part of the court of Nebuchadnezzar. In Daniel 1:20, God tells us that Daniel was 'ten times more wise and understanding than all the learned magicians and enchanters'. The Magi were part of those magicians and enchanters. Then, in chapter 2, Daniel saves the lives of all the enchanters and magicians because he could interpret the king's dream when they could not. Over and over again, Daniel demonstrated that his God was able to interpret dreams, unlike their gods. The Magi had come to the point where they greatly revered Daniel and his writings. Therefore, they had access to Daniel's prophecy detailing the precise coming of Messiah, and they knew that they were living within 33 years -- a man's lifetime -- of the mathematics of Daniel 9:24-27 of being fulfilled. Because they knew the prophecy from "Daniel's God", they were primed to expect the appearance of the Jewish Messiah. Thus, when God caused His "star" [Shekinah Glory] to arise in the East, these Magi knew in their hearts that this was the sign for which they had been awaiting. Of course, since we see that the Holy Spirit was active in their hearts in Matthew 2:12, we can probably safely conclude that, at the time they saw God's "star" arising in the East, the Holy Spirit activated their long and arduous journey. Thus, we can see that Zoroastrianism has a long history in the annals of time, and that some of their Magi were active in fulfilling God's Plan for the birth of Jesus Christ. However, we must not lose sight of the fact that these Magi were pagans through and through, back then, and they are just as pagan today. While they considered the Jewish Messiah to be "divine", they considered Him to be only the Jewish god, no different than the gods of the other nations of the world. 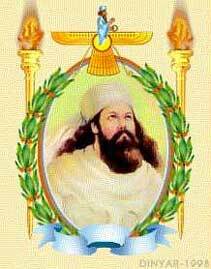 ZARATHUSTRA IS A LUCIFERIAN MESSIAH WHO WORE ONLY WHITE! Finally, notice that Zarathustra is carrying a Staff of Authority, or a Rod, in his left hand. This Rod is also a symbol of the Lucifer Sun-God . There is tremendous Satanic power behind a Staff -- Rod -- of Authority. Look carefully at this staff, for from it, the Roman Catholic Pope gets the staff on which the Crucifix is perched; however, now carries the pathetic, twisted figure of Jesus Christ on a Twisted Cross; in the 6th Century, Black Magick Satanists created this staff in derision of the traditional Catholic Crucifix, but adopted it later as a symbol of their Antichrist [See RC100 for full details]. 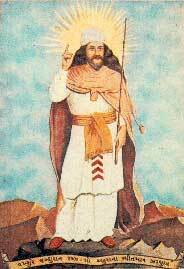 Now, we know two very important facts: Zarathustra is the Lucifer Sun-God, and he always wears white! Thus, in modern Illuminism, this Zoroastrian belief is completely carried forward. The top spiritual leader wears white and he is considered the Lucifer Sun-God! Before we leave this issue of Zarathustra, we need to address the only time in which we found him depicted in a color other than white. As you can see from this picture, he is shown in a strange blue, a color identified as "Tortoise". This is the only picture of Zarathustra in which he is not dressed in white; rather, he is dressed in a light blue, called Tortoise. In the religious dogma of Illuminized Satanism, the robes of the most highly ranked priests were colored this shade of light blue. Thus, you can see that Zarathustra is dressed in robes of the highest ranking priesthood, which is certainly fitting, since he is considered divine, a Messiah figure. But, Cisco Wheeler, former Black Magick Satanist, says that this depiction in these light-blue robes is a new depiction of him. This change from traditional white robes to these light blue means that powerful, magick ceremonies have now occurred that brings Lucifer into the ceremonies, manifesting himself into this dimension through ritual. This new depiction of Zarathustra in these blue robes is a signal to fellow Illuminists that the hour of Antichrist's appearance is, indeed, close. 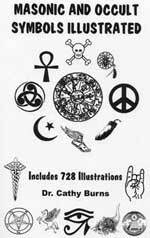 This revelation from a former Satanist brings us squarely back to our original premise: this upsurge of the polytheistic religion of Zoroastrianism, founded by Zarathustra, is not only remarkable in the strict Islamic Republic of Iran, it is also interesting in light of the many "signs" that the appearance of Antichrist is close. It does seem remarkable that this ancient religion which prefigures the Illuminati and their Masonic Christ -- the ultimate Lucifer Sun-God! -- is now strongly resurgent in the country of its birth. How soon might the Latter Day Zarathustra arise, you might ask? Again, we go back to our picture, above. The word, "Tortoise" speaks of the slow, deliberate pace at which events are moving the world into the Kingdom of Antichrist, the New World Order. As the fairy tale tells us, the race belonged to the tortoise, not the hare! The Illuminati Plan to produce Antichrist was designed to proceed "slow as molasses", but very thorough. We Christians want to go to Heaven so badly we are constantly asking, "When, O Lord", or "How Long"? We must adopt patience, not despairing when events do not occur when we think they should; further, we should not be thinking that, just because the next step has not followed within a certain period of time after the previous step means that the process has stopped. Too many American Christians have come to the conclusion that, just because the next step did not occur quickly after 9/11, the process to the New World Order is off. Nothing could be further from the truth.